This detached villa near Lagos is ideal for large families or friendly families who want to go on holiday together. Casa Monte Cristo Too has five spacious bedrooms, plenty of space! You have a large private swimming pool with a lovely sun terrace, of course there are sun beds available for you. Relaxing in the Portuguese sun makes you the plans of the day; a day of shopping in Lagos with a dinner in one of the many restaurants? Or a day touring along the beautiful coast with beautiful beaches that the Algarve is so famous for? You can also go for a day at the beach, while Praia da Luz is 4.5 km away and the large, long, sandy beach Meia Praia is 5 km away. Nature lovers go to the north and the surfers are at the right address. Or you will stay at home, you will fully enjoy it! The villa is comfortable and fully equipped with a spacious living room and a large kitchen. The villa, swimming pool and one bedroom / bathroom are wheelchair accessible. There is plenty of car parking space, a water fountain and wonderful gardens with fruit trees. Large purpose built slope for wheelchair access to the front of the house. With miles of beautiful golden beaches and cool seas, the Algarve is one of Europe’s most popular holiday destinations; and with some of the most spectacular coastal scenery it really does have so much to offer. Together with the beautiful weather and the comfort of Casa Monte Cristo Too, you will really get a taste for the Portuguese way of life. Explore the towns and see the culture of times past still in place with the unique architecture that reflects the rich cultural history and heritage of this beautiful country. You could even venture further, explore the coastline of the region, visit the beaches some of which remain a local secret; wander through the towns for a spot of shopping or lunch, visit Sagres and Cape St Vincent, the most westerly tip of Europe and see some daring fishermen perched precariously upon the cliffs. The Algarve can offer the perfect holiday for everyone from families, sports enthusiasts, those who want to relax and those who want to explore the rich cultural heritage of this region. Lagos is located minutes away from Casa Monte Cristo and with a world famous seafaring tradition, it has a rich cultural heritage which you will find at every corner when you explore this town. Its Marina is one of the finest in the region, which basks in the sun and is within walking distance of the main facilities of the town itself. Here you will find some good restaurants and bars looking out over the Marina. With the beautiful golden sands of Meia Praia, Lagos offers visitors plenty to see and do. The famous winding streets are full of a variety of shops which offer everything from traditional pottery and crafts to fashion as well as a wealth of restaurants serving a mixture of cuisine including the traditional Portuguese dishes. Visit the summer market, where you can see everything from clothing to local foods and crafts and the world famous fish market. There are some superb sports facilities in and around the town which offer visitors the chance to go water-skiing, wind surfing, scuba diving and boat rides around the coastline. Lagos is a wonderful place to experience the local cuisine from the small cafes in one of the many squares, to a variety of restaurants where you can spend your evenings sampling the local dishes. The best selection of restaurants is concentrated in the pedestrians-only Rua 25 de Abril. It has a cosmopolitan atmosphere and you will find the best places to sit and watch people go by are at the open-air cafés in Praça da República, next to the tourist information office. Its relaxed atmosphere and quiet charm, make it one of the most appealing locations in the Algarve to visitors. 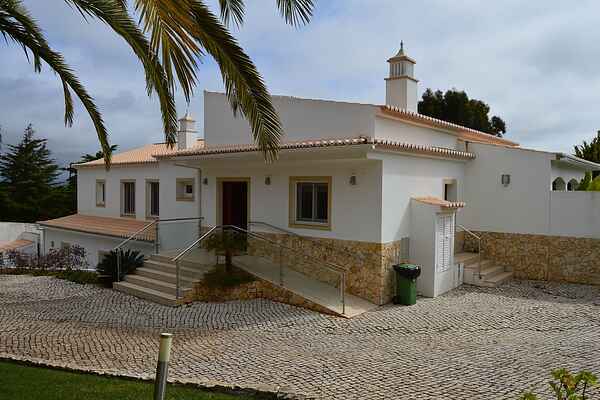 The village of Praia da Luz is a few kilometres from Lagos and a short drive from Casa Monte Cristo. It is well known for its friendly, relaxed holiday atmosphere with the charm of a traditional Portuguese village. Its name literally means ‘The Beach of Light’, taken from its past when beacons were lit on the beaches to warn fishermen of the approaching danger from the Moors. The beaches here offer safe, wide golden sands and plenty of sports facilities ranging from scuba diving, micro-lite and horse riding. As well as the facilities that this resort has to offer, there is also plenty to explore. Walk along the promenade, the Moorish past of this region is inescapable including a coastal fort which is now an excellent restaurant. Also visit the ‘Black Rock’ (Rocha Negra), and see the lava which was produced some 190 million years ago - a noticeable addition to the coastline against the golden cliffs that surround the coastline. There are also some roman remains to be seen. The narrow streets meander up from the beach, past white washed houses, to the village centre where you can enjoy some traditional Portuguese dishes in one of the cafes or see traditional pottery and crafts that this region is renowned for. Old and new blend intimately together offering visitors a culturally rich town to explore and a beautiful beach where you can relax and soak up the sun.